Little bits of sewing happened this past week. 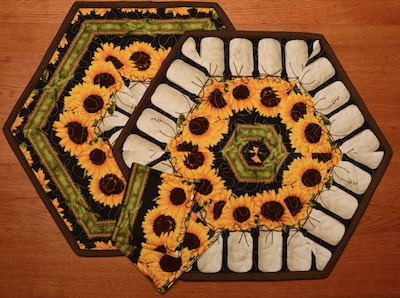 Using a few orphan blocks – ones I received years ago in a block exchange – I made 2 placemats as gifts to my Father who is moving into an assisted living apartment. I dug through my precuts to find similar shades of fabric to make the 2 coasters. For this set, I just did a simple meandering with little loops. For a second set of placemats I used 2 pieced hexies. A friend had cut & sewn together the wedges and then give them with extra fabric to me. Basically, I’m just finishing something she started. 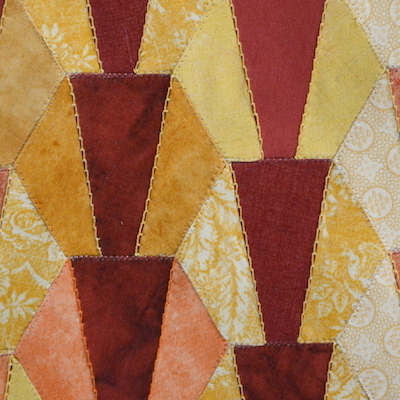 I sandwiched her pieced hexies and did a simple meander for the quilting. For the coasters I cut squares from extra wedges she gave me. The back and batting also came from my friend. So like I said, I just finished something she started. I found a brown from my stash that I thought went nicely for the binding. 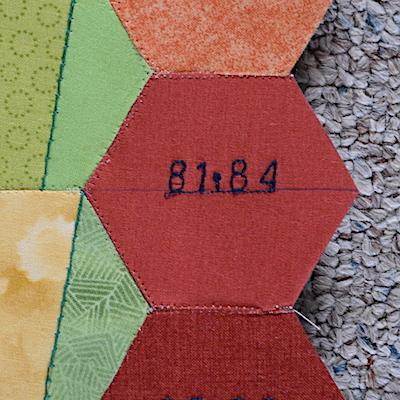 I’m keeping up with making the daily hexies for the Temperature Quilt. I even started sewing the days together. 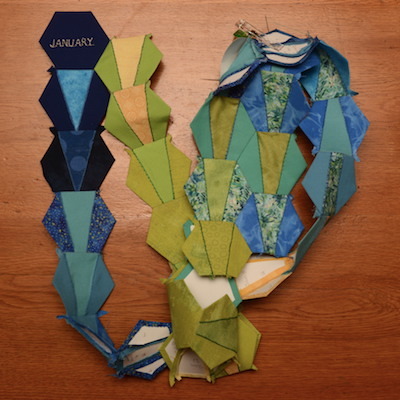 I have the January hexies stitched together and started adding February. My previous English Paper Pieced projects have all been small, this Temperature Quilt is going to be large in comparison! Since working on this scale of EPP is a new experience for me, I’m OK with how slowly this project is going. 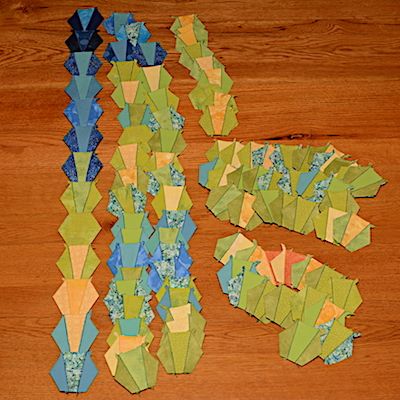 A tangle of pieced hexies! Motivation for sewing/quilting it at 0% right now. To-Do: FIND motivation! I must need a break. 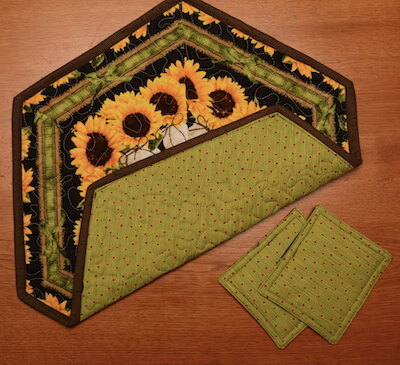 ✔️ Kind of … I’ve not working on FMQ as I planned this month, but I did make 2 placemat sets for my Father. 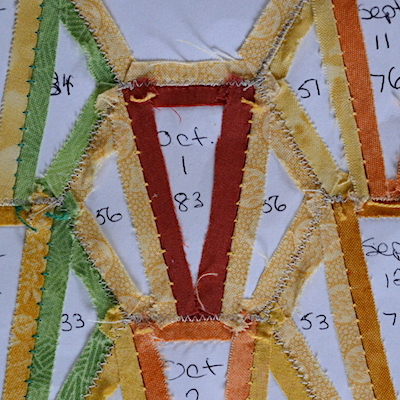 I’m keeping up with the daily stitching of hexies for the Temperature Quilt, but not stitching them together yet. ✔️ I’ve got January sewn together and started on February! Quick weekend trip to PA to assist Dad in settling in to new assisted living apartment. 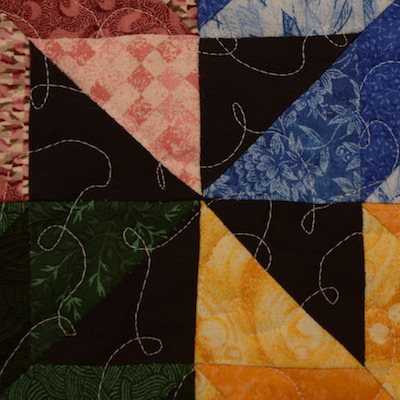 Mark some blocks for FMQ on Chic Country, maybe even quilt them. No, I really didn’t get sidetracked! I am just finally caught up on a year long project and decided to share the progress! 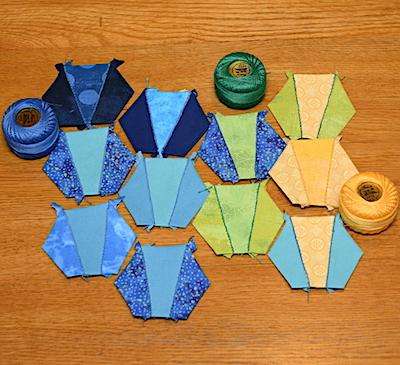 These pieced hexies are for my Temperature Quilt. I didn’t get all the fabric together until February. Since then, I have been trying to do two hexies a day to get caught up to present. I reached that goal this week! 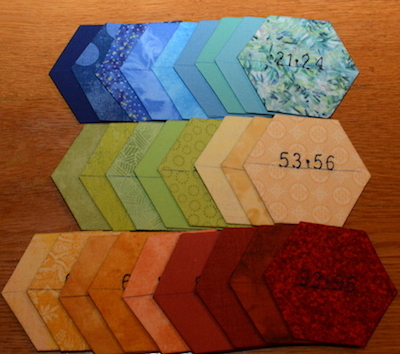 I have all the hexies pieced through today. 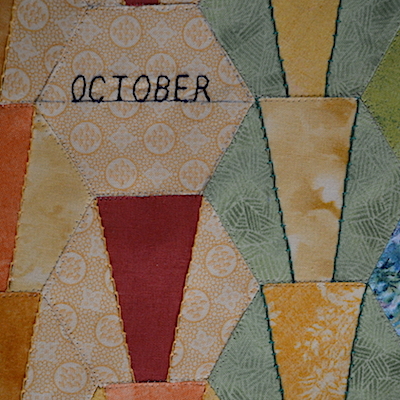 But I still need to get caught up on stitching the daily hexies together into months. January is under way, left side of the photo. 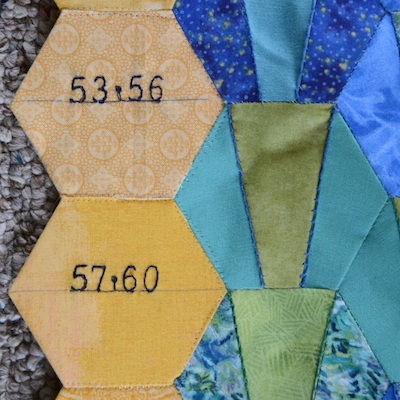 Each hexie is showing the low temp of the day in the two outer pieces, and the high of the day in the middle. Another EPP project that I’m finishing is prepping for a class at my local public library. 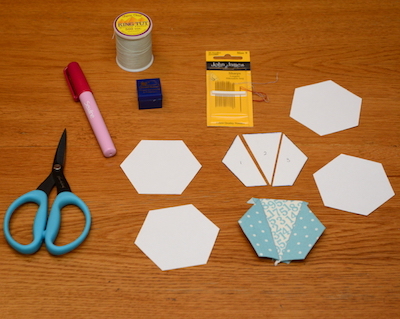 I’ve put together kits for each person to make a little rosette. And now I’m working on a few simple projects to show what you can do with the rosettes. I need to stitch this rosette down to the fabric. It will be displayed in the 5″ hoop. And for my To-Do list for this week, I did finish the purse made from a man’s suit. I’m calling it the Midtownman Purse, that was the tag inside the suit. 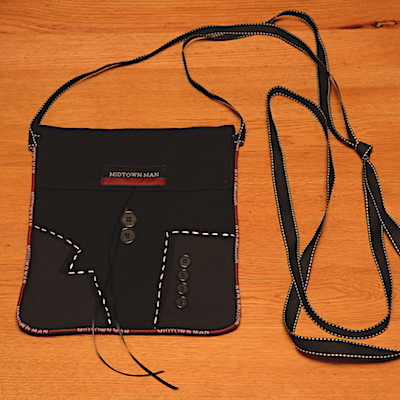 There is black ribbon stitched under the Midtownman tag, wrap the ribbon around the center buttons as a closure for the purse. I left the strap/ribbon long, which can be shortened to fit the build of the gal receiving this purse who wanted it as a crossbody purse. Sandwich baby quilt. ✗ Hmmm. No, but I did buy a batting for it today. Finish purse. ✔️ Ready to deliver this Friday! 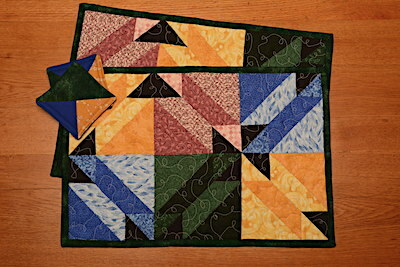 Sandwich & start quilting baby quilt! Work on UFO – Dresden Plate Table Runner. It’s been a crazy week with my son and his family living 2 hours away but driving up to house hunt. After staying with us Thursday – Monday, they drove home late Monday just to get a call from the Realtor that a new listing will be available to look at Wednesday morning. They are driving back up tonight! Phew! I hope they find their dream house soon! Linking to To-Do Tuesday and Linking Tuesday. I thought I had my year planned out for 2018 with all my quilty goals for the year. 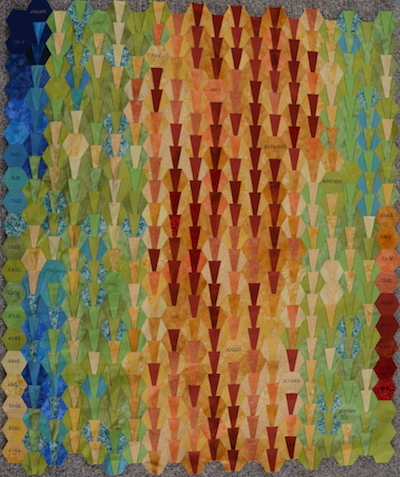 Then up pops a Temperature Quilt from 2017 on Needled Mom‘s blog. Now I just HAVE to make a Temperature Quilt! Gah! 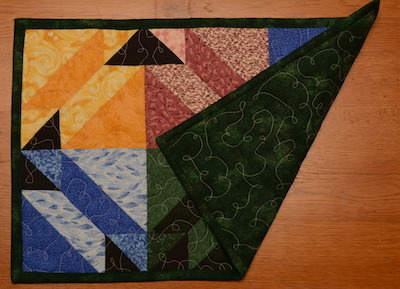 Needled Mom made a Temperature Quilt for 2017 using a flying goose block. She divided up the thermometer in 4 degree increments selecting a different fabric for each increment. She used the high of the day for the goose and the low of the day for the sky. This year she is making a Temperature Quilt with Square-in-a-Square Blocks. Her sister joined in making a quilt too. Since one lives in CA and the other AK, their two quilts look way different! Take a look at Needled Mom‘s blog. 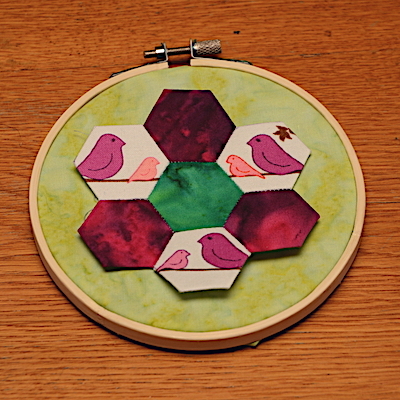 I’ve settled on using a pieced hexie. I took advantage of Paper Pieces 25% off sale they offered earlier this week. Seeing their sale kind of clinched it for me, that I should jump in and make a Temperature Quilt this year! This all leads to my One Monthly Goal for February. For February, my goal is to organize this project! 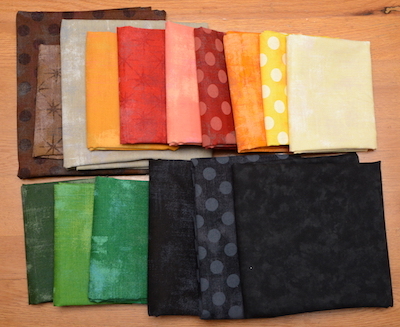 I’ll need to pull and purchase fabrics while waiting for the hexie paper pieces to be shipped. 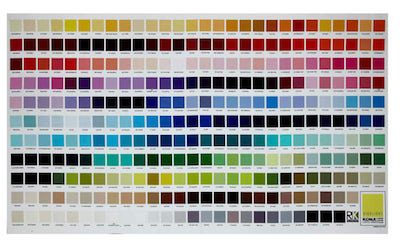 I’m using Kona Fabrics color chart panel to select fabrics to represent the temperature increments. Since I’m already over a month behind, I hope to get fabrics sorted this weekend & start some piecing. If I had started at the first of the year, I would only need to piece one hexie a day. Hopefully over the next few months I’ll be able to get caught up. 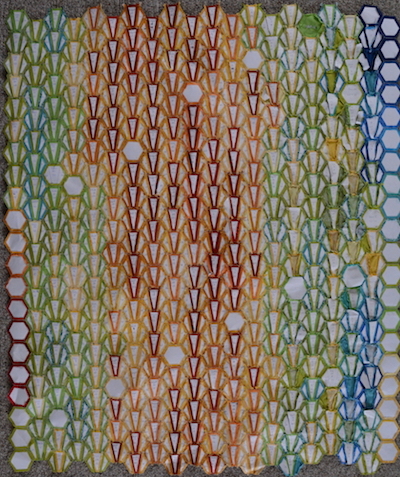 Above is the hexie design I plan on using. Linking to One Monthly Goal sponsored by Elm Street Quilts.